President Obama’s approval rating is at its highest level in more than five years, an ABC News/Washington Post poll released on Sunday shows. According to the results of the survey, conducted in the aftermath of the mass shooting at a gay nightclub in Orlando, Fla., two weeks ago, 56 percent of Americans approve of Obama’s handling of his job as president, compared to 41 percent who disapprove. The last time the president’s approval rating was this high was in May 2011 following the killing of Osama bin Laden in a nighttime raid led by U.S. Navy SEALS in Pakistan. According to the Washington Post, Obama is more popular now than Presidents George W. Bush and George H.W. Bush were at this point in their presidencies, though not quite as popular as Bill Clinton in 2000. 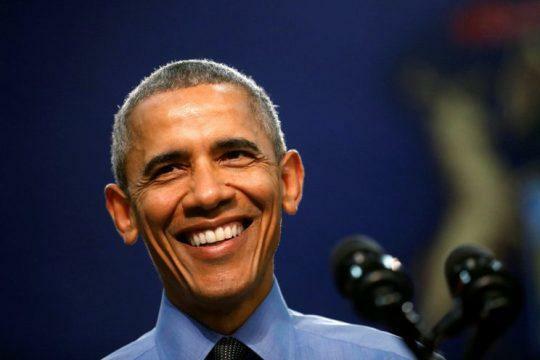 The results of the survey are in line with a recent CNN/ORC poll that found 52 percent of Americans approve of Obama’s performance as president, up 5 points since January. Both Clinton and Ronald Reagan were viewed favorably “by just under half of adults in the spring or summer of their final years in office.” George W. Bush’s favorability rating, by contrast, was just 38 percent at this point in 2008. All of this is good news for Hillary Clinton, who was endorsed by Obama earlier this month. The president plans on campaigning for the presumptive Democratic nominee in the coming weeks and has already begun to take aim at her Republican opponent, Donald Trump. In Seattle on Friday, Obama offered a preview of his anti-Trump stump speech while speaking at a Democratic fundraiser for Washington Gov. Jay Inslee.